The New York City Subway map has been annotated according to smell by visitors to the Gawker.com website. This is a bit of a stinky mashup of NY, and it's amusing that the only smells recorded at Flushing Ave station (on the G line) are those of Feces. I read over at Ogle Earth this morning that a new beta version of Google Earth v4 has been released. I was pleased to see that the ability to access standards-based OGC Web Map Service servers has been included in this version. Whilst this is an improvement upon the previous methods people had of including WMS geodata as an image overlay in Google Earth, it does seem to be hidden away in an options screen (the Refresh tab under Add Image Overlay) that doesn't make much sense to me. Also I wonder why layers you've selected in there aren't added as children of the Google Earth layer you've created, allowing you to enable and disable layers from that WMS when desired. Most importantly, this is the first version of the Google Earth v4 beta that hasn't crashed my Mac when I try to zoom in to an area. OpenStreetMap is celebrating two years in the making of a freely available street map of the world. Got a GPS device? If you go out walking with your GPS, or go geocaching, then your tracklogs could help build up a picture of the area around you. 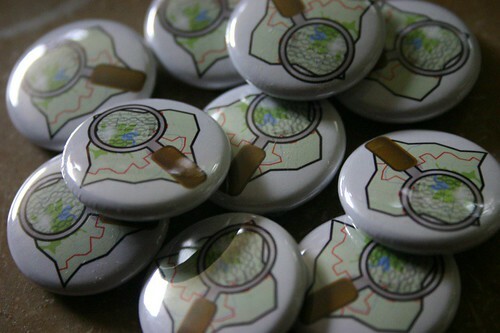 Read more about Happy Birthday OpenStreetMap! I went hunting for my first ever geocache today and found it without too much effort. There were a couple of little goodies in there along with the visitors log. I didn't take anything, but signed my name and left an OpenStreetMap badge to try and spread the word of open mapping to people around Stuttgart who have GPS devices. My finding the cache brought on a long spell of very heavy rain - not a good thing when at the top of a hill in just a t-shirt! I did manage to walk 12km today though, most of it whilst drenched. Despite only having the clues for the first cache, I went looking for a few more that were nearby. I got to the location of the first but after a little searching I spotted what looked like a syringe sticking out of the ground and gave up the search. Looking at the clues online later, it seems that the waypoint I'd downloaded to my GPS was just a starting point for finding the cache, so I was looking in the wrong place anyway. On my way home I stopped to find another and was within 50 metres or so of it, but the GPS wasn't working so well under tree cover and kept changing its mind. Next time I go out geocaching, I think I need to take more of the clues along with me.